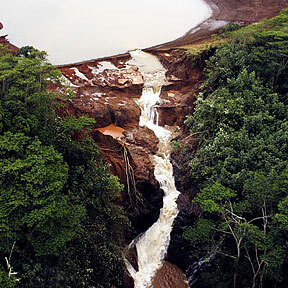 KAUAI DAM BURST: The water path of the Ka Loko Dam burst was evident yesterday in this photo by Casey And Cyndi Riemer of Jack Harter Helicopters SPECIAL TO THE STAR-BULLETIN. Floods burst one dam and strain another, forcing evacuations from the north shore. The landowner was making improvements to the reservoir as part of a settlement. Enny Williams' snack recipe wins the favor of Pillsbury Bake-Off judges. Coach Shoji shows his indebtedness by bringing UH to an Illinois tournament. Extra! Extra! Star-Bulletin 5th Anniversary Special! Five years ago today, the staff of the Honolulu Star-Bulletin, led by bagpipers, marched down South Street from the News Building on Kapiolani Boulevard to its new home at Restaurant Row. Gasoline makers will have to import the additive for the next year to fulfill a state blending law.